The Postman knocked twice and quite spoiled my breakfast egg and soldiers delivering the above, particularly as I had paid the Dartford Crossing twice on line for two journeys, so how come I received a Penalty Charge demand for £70 for the return journey. To make matters worse, I discovered I had paid £4 for each of the two journeys and not the advertised amount of £2.50! Shaking out my journalistic skills not often used since retirement a few years ago, I give this message as a warning for those who do not know all is no longer financially simple getting from Essex to Kent and vice versa. The £4 crossing is what you will pay when booking and paying online if you are not wearing your glasses; and it is basically quite legal, though questionable. Before you blow a gasket read below as the fee is still £2.50 a crossing. The loophole that no one appears capable of closing, is in the ‘Pay on Line’. Since the removal of the Toll Booths at the Kent end of the crossing, paying now requires motorists to search the Internet to pay the fee of £2.50, prior to the journey or shortly after with time limit of one day’s grace before receiving a fine of up to £70. As an occasional traveller over the crossing, an internet search brings up a battery of offers with different names. It is worth pointing out here that the official site UK GOV DART CHARGE from the Department of Transport is the one to use. 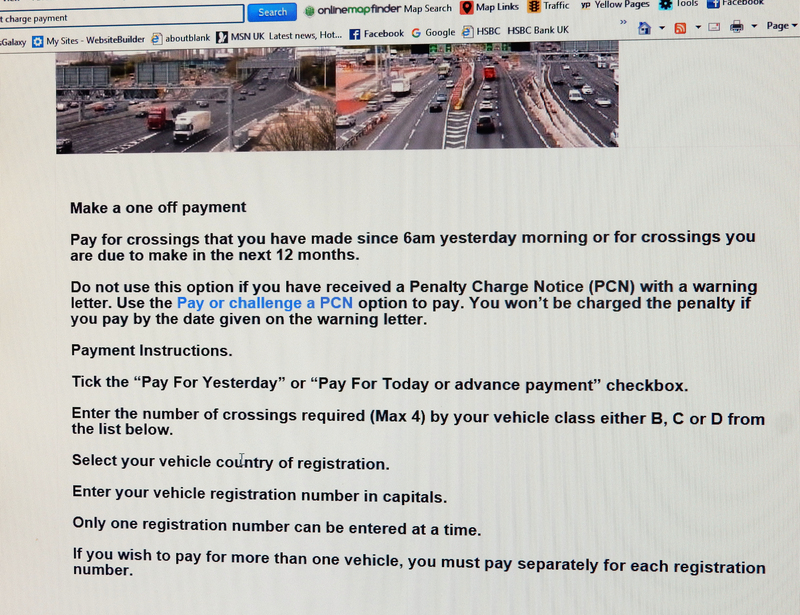 Totally unaware of any complication and typing in Dartford Crossing into my computer search engine, a listing of alternatives from; ‘Dart Charge’; ‘Dartford Crossing Charges’; ‘Pay Dart Charge’; brought up a busy page, and automatically selecting the top Pay Dartford Crossing charge. The resulting page was as I would have expected, two pictures of the crossings and instructions on how to pay the fee. What I did not realise was the top name ‘Dart Charge’ was a private company and nothing to do with the administration of the crossing as disclosed below in their opening page. The text at the top of the pictures has an opening line of The Dartford Crossing is managed by Highways England on behalf of the Government. Most people read this and are satisfied it sounds right. Only if you read it all do you come to, ‘This site charges an administration charge of £1.50 and is not affiliated or associated with any of the above. Alternative payment methods are available see below for full details. Not noticing the above and in a hurry, I paid by card but only later when I looked at my bank statement did I see two charges for £4 each. It seems this company, The Dartford Crossing Charges Ltd, pay your £2.50 fee to the proper authority and take their commission of £1.50 covered in an overall payment of £4. It so happened they appear to have failed to advance the normal fee from my second booking and I later received a Dart Charge Warning letter (top) with the Red C logo from the Department of Transport advising of a fine of £70 for non payment. Despite looking hard at this, as far as I can see it is not illegal and the list of offers on the internet to take your money is from quite a few companies. The catch in this case was placing their company under Dart Charge on a site called ‘Search on the Internet’ and conveniently placed their name on top of the listing. Apparently this is an advert but even wearing my glasses, it was not obvious. I contacted the GOV.UK site to ask why the increase and was told there is no increase but they were aware of this and other companies and their charges, but little they could do to stop them. The obvious answer is to read all the print, small and large and down to the bottom of the page as they will tell you they are not doing anything illegal, and did refund the £3 for both journeys when I complained. It seems there is a potential loop hole in the system, and though quite legal, is it not time to look at the circumstances under the consumer usage banner, for this certainly does not feel right?